The WHO European Region has the highest proportion in the world of total ill health and premature death due to alcohol. A country’s total per capita alcohol consumption is closely related to its prevalence of alcohol-related harm and alcohol dependence. This high level of harm hides enormous alcohol-related health inequalities between eastern and western Europe, particularly for injury deaths. Both the volume of lifetime alcohol use and a combination of frequency of drinking and amount drunk per occasion increase the risk of health and social harm, largely in a dose-dependent manner. The risk of death from a chronic alcohol-related condition is found to increase linearly from zero consumption in a dose–response manner with the volume of alcohol consumed. At a societal level, the European Union is the heaviest-drinking region in the world, with over one fifth of the European population aged 15 years and above reporting heavy episodic drinking (five or more drinks on an occasion, or 60g alcohol) at least once a week. Heavy episodic drinking is widespread across all ages and all of Europe, and not only among young people or those from northern Europe. 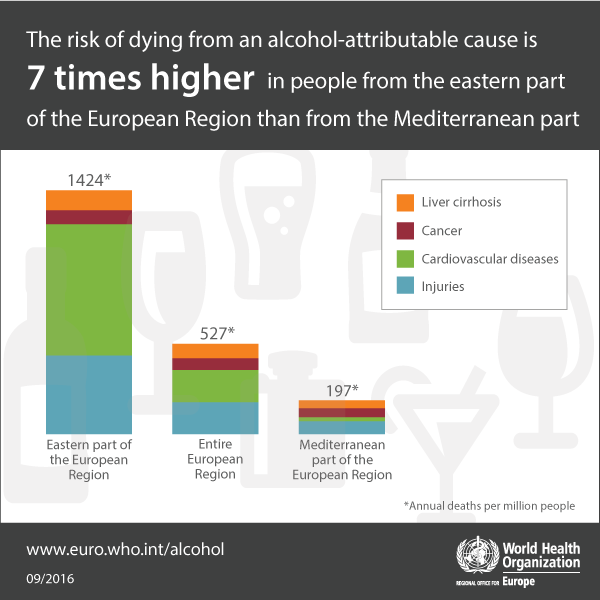 The European Information System on Alcohol and Health (EISAH) provides easy and rapid access to a wide range of alcohol-related health statistics. This joint project of the European Commission, WHO headquarters and WHO/Europe is part of the Global Information System on Alcohol and Health (GISAH). EISAH is an essential tool for assessing and monitoring the health situation and trends as related to alcohol consumption, alcohol-related harm and policy responses in countries. Q&A – How can I drink alcohol safely?